Endnotes, citations, and figures are available in the PDF version of this issue brief. How a state chooses to design its system of funding schools is ultimately a question of education governance, determining who—state policymakers, school districts, or school principals—gets to make the decisions about how and where funding is spent. States have two primary ways of funding schools: the foundation, or base funding that is intended to cover the basic costs of education (teacher salaries, textbooks, materials, and more); and categorical funding targeted to specific purposes (reducing class sizes, programs for English language learners, special education, and more). Education researchers Amy M. Hightower, Hajime Mitani, and Christopher B. Swanson define categorical funding as “state aid intended to provide financial support for specific educational programs, operational functions, or financial activities.” With categorical funds, priorities are set by the state to enact what state officials view as the most desirable programs. By its very nature, categorical funding is narrowly directed, and as such, district flexibility is limited. On the other hand, if states provide funding just as a base grant to districts, districts then have the flexibility to use their budgets to meet the specific needs of their students as they see fit. Thus, control over how money is spent translates into control over policy decisions. States have taken varying approaches to categorical grants, some relying on them heavily and others rarely or not at all. This issue brief provides a national landscape on the use of categorical funds by states, the number of categorical programs in each state, how the use of categorical funding has changed since 2008 when states were last surveyed on their use, and views on their effectiveness from state finance personnel. In addition, this issue brief includes case studies of four states and their use of categorical funding. We use a combination of prior research on state education finance, existing data from state and national organizations, and newly collected primary data—a state-level survey and district-level interviews—to inform our findings. Like most issues related to education, categorical funding has its supporters and opponents. Proponents argue that allocating money to special programs—for example, interventions for struggling students and programs for gifted and talented students—helps schools and districts meet state performance goals and ensures the money is spent on established policy goals. But opponents of categorical funding argue that it provides “one-size-fits-all” solutions to a state’s complex and varied educational needs, rather than presenting school districts and/or schools with an array of options. There are other criticisms of categorical funding. Despite a stated aim to use categorical grants to provide targeted support in order to create a more equitable resource allocation system, the reverse has been found at times. In California, for example, the heavy use of categorical funding led districts to offset the categorical funds targeted for high-need students by allocating a larger portion of unrestricted funds for students with lower needs, supplanting the purpose of the categorical funds. In addition, categorical funding does not necessarily lead to improved student outcomes. Opponents argue that categorical funding limits local districts’ flexibility and stifles innovative approaches to improve student achievement. Critics also point out that decisions on how to use limited funds efficiently is determined better at the local level rather than at the state level. Categorical programs may also inadvertently group students inappropriately, reducing a school’s or district’s ability to cater to the unique needs of different student populations. In one study of English language learners, or ELLs, it was found that the ELL categorical-funding allocation did not take into account the diversity of student needs within the ELL population, which may require different resources depending on factors such as home language, number of years in the United States, and parental background. In addition to these criticisms, categorical programs are also not always a steady source of funding. The use of categorical funding in state education budgets fluctuates with changes in government as well as changes in the economy. Consider the case of California, where the economic downturn spurred the legislature to loosen restrictions on 40 of the state’s categorical programs in 2009. Existing regulations on how the funds in these programs could be spent were removed, thus enabling local districts to make decisions on how to best utilize this newly established flexible funding within the context of significant state budget cuts to the general fund. Previous research—while limited—shaped our design and framework. Most of the research on categorical funding is focused on California, which at times has had more than 60 different categorical programs. But in one of the most relevant studies of categorical funding—“State Policies That Pay: A Survey of School Finance Policies and Outcomes’’—education researchers Hightower, Mitani, and Swanson’s national survey found that targeted categorical funds in fiscal year 2008 mostly went toward the following program areas: special education, transportation, capital outlay/ debt service, technology, or gifted and talented programs. They also found that perceptions of categorical funding varied state by state and to some respondents; as a result, formula-based and/or student-weighting mechanisms and categorical funding could not be easily distinguished. 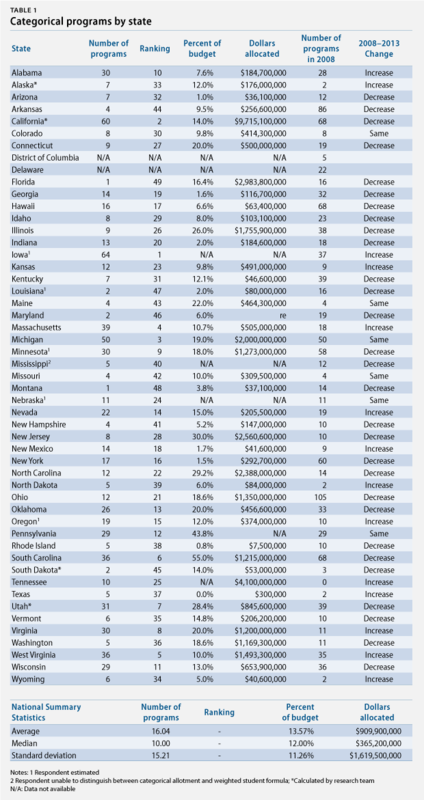 More recently, the Education Commission of the States, or ECS, a nonpartisan organization dedicated to improving public education, reported that the number of categorical-funding programs per state varied considerably, with most states utilizing six to a dozen such programs. The majority of funding in most states, ECS found, is disbursed through a formula instead of through categorical grants. Given that the recent economic downturn has likely changed the funding landscape for education at the state level, coupled with growing interest in having a more transparent finance system, we wanted to evaluate the role that categorical grants currently play in state education funding systems. We conducted a two-phase study. First, we administered a survey of chief financial officers in each state on the number and use of categorical-funding programs in states’ K-12 education funding formulas. The survey questions also asked about their views regarding the effectiveness of categorical funding in helping states to meet student improvement goals. Thirteen states did not respond and two declined to be included, resulting in a final sample size of 36 states. To facilitate comparison across states, respondents were asked to select which programs use categorical funding from a list of program categories derived from prior research. We obtained data on the number of categorical-funding programs and the dollar amount allocated for categorical programs from states not responding to the survey through Internet research and phone calls to state school boards associations. We supplemented our survey with interviews in four states—Arkansas, California, Ohio, and Wisconsin—to better understand the impact of categorical funding on school and district efforts to improve student performance and meet the requirements of state and federal accountability policies. The four states were selected to maximize variation across the following criteria: student demographics, geographic region, and political orientation. These four states represent a reasonable sampling of national trends across these indicators and all have taken different approaches to categorical funding in recent years. In these states, we conducted interviews with district superintendents (n=6) and local school board members (n=2) from two districts in each of the four case study states to understand their perceptions of categorical funding. Interviews covered the uses of categorical programs, strategies for the effective use of categorical funds, and challenges related to categorical funding. There is currently a wide range in the use of categorical funding across states. States employed an average of 16 categorical programs in the 2012-13 school year, a drop from 25 in FY 2008. Half of the states used between 1 to 10 programs. The average dollar amount allocated through categorical funding was nearly $1 billion. South Carolina reported allocating the largest percentage of their state education budget to categorical programs—55 percent. Iowa had the greatest number of categorical programs—64 (a notable increase from FY 2008, when they reported having only 37 programs). Under each category, respondents had the option of selecting “other” and writing in the program. Categorical programs targeting schoolwide programs varied across the states. Sixteen states reported that they employed a school nutrition categorical program, while seven reported categorical funding going to class-size reduction, and eight reported safety and violence prevention programs. Special education was the most common state categorical funding program targeting specific populations. This mirrors Hightower, Mitani, and Swanson’s fiscal year 2008 findings. There were a variety of programs listed under “other” programs for targeted populations, including poverty alleviation, high-need special education, orphans, educational excellence, early intervention, ACE remediation—statewide initiatives designed to raise expectations for student achievement—reading sufficiency, Indian education, desegregation and integration, expelled and at-risk students, math and reading intervention, small schools, youth in custody, and catastrophic aid. 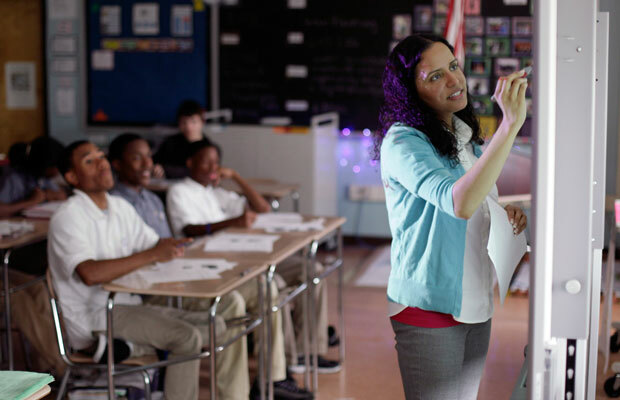 Among categorical programs related to teacher support and professional development, general professional development grants were the most common categorical program for the support and professional development of teachers, followed by math and reading professional development, teacher recruitment and retention programs, and teacher retirement and benefits programs. Principal-training programs were the least common, reported by only three states. Some of the “other” categorical programs written in under teacher support and professional development included teacher evaluation, teacher salary supplements, special education salary supplements, and national board certification programs. Facility-related categorical programs included capital outlay/debt service programs, used to acquire, build, remodel, or maintain school-district facilities and capital outlay projects (reported by 12 states). They also included maintenance reimbursement programs reported by six states, and school and library improvement programs reported by seven states. The two most common miscellaneous categorical programs were pupil transportation, reported by 21 of the 36 states, and charter school grants, in seven of the 36 states. Pupil transportation was the second-most common categorical program overall, after special education. We took advantage of the fact that a similar study of categorical programs had been done for fiscal year 2008 by Hightower, Mitani, and Swanson to provide a longitudinal look at the use of categorical funding. The earlier study was also conducted as a survey administered to state education agencies and similarly asked how many categorical funding programs the state employed, the program categories, and the dollars allocated to such programs. As such, we examined whether the use of categorical funding had changed in the past five years, the impact of the economic downturn on their use, and the locus of control in each state. Of note is that the five states that used the highest number of categorical programs in FY 2008—Ohio, Arkansas, California, South Carolina, and Hawaii—all reduced their use in the 2012-13 school year, with some large declines, such as in Ohio that went from 105 categorical-funding programs in FY 2008 to only 12 such programs in the 2012-13 school year, and Arkansas that went from 86 programs to only 4. Some of these reductions can be attributed to the consolidation of programs, such as in Utah where eight categorical programs were consolidated with other programs in FY 2012, reducing the number of categorical-funding programs in the state from 39 to 31. At the other end of the spectrum, the change from FY 2008 to the 2012-13 school year was more varied: All five states with the fewest number of categorical-funding programs increased their use. The largest jump among this group of states was in Tennessee, which went from being the only state with no categorical-funding programs in FY 2008 to having 10 in the 2012-13 school year. Figure 4 shows that there was also a fairly even split between states that reported that the economic downturn resulted in the decreased use of categorical-funding programs (n=14) and those that felt that it had no impact on the number of programs (n=13). A variety of contextual factors explained these different reactions to the economic downturn. “Categorical allotments for staff development and technology were eliminated due to the economic downturn,” reported the respondent from North Carolina. In contrast, a few states (n=4) reported increasing the use of categorical funding due to the economic downturn. “Because our largest categorical program is poverty funding, the program required increased funding with the economic downturn due to increase in poverty,” reported the respondent from Arkansas. Decisions to start or end categorical programs determine, in part, policy priorities for each state. For example, creating a class-size reduction categorical program shows a state’s belief in the benefits of a smaller student-teacher ratio. We wanted to know who held the decision-making power over creating or ending such programs. Vesting such decision-making powers in the legislature or governor might result in the adoption of partisan policies, while the state board of education might be assumed to adopt nonpartisan programs. As shown in Table 3, the legislature in nearly every state included in the study (n=36) was reported as having decision-making power to create new categorical-funding programs and the power to end or consolidate such programs. The locus of control included the governor in nearly half of the study states (n=16). In only one state (Kentucky), the voters have the power to create a new categorical program, but not to consolidate or end a program. Other decision-making bodies noted by states included a state’s department of education, state board of education, and commissioner of education. Categorical funding helps schools and districts meet student improvement targets. Categorical funding helps schools and districts meet the requirements of the No Child Left Behind Act. Categorical funding limits local innovation. Categorical funding limits flexibility of schools/districts. Categorical funding impedes the efficient use of funds. The majority of state respondents (54 percent) agreed or strongly agreed that categorical funding helps schools and districts meet student improvement targets. (see Figure 5) A large number of states (13 out of 35) were neutral on the topic. But state respondents are more neutral on whether categorical funding helped schools and districts meet the requirements of the No Child Left Behind Act. Their responses, however, veered toward the affirmative end of the spectrum. Slightly more varied responses were given regarding whether categorical funding limits local innovation, limits the flexibility of schools and districts, and impedes the efficient use of funds. While a plurality of the state survey respondents remained neutral on these topics, feelings were more mixed than on the questions around categorical funding helping schools and districts meet student performance targets and NCLB requirements. Forty-three percent of state-level respondents strongly disagreed or disagreed that categorical funding limits local innovation, and 46 percent indicated that they strongly disagreed or disagreed that categorical funding limits the flexibility of schools and districts or that categorical funding impedes the efficient use of funds. It is worth noting that some state-level respondents did acknowledge negatives: Three felt that categorical programs do not help schools and districts meet student improvement targets; five felt that categorical funding does not help schools and districts meet the requirements of the No Child Left Behind Act; seven felt that these programs limit local innovation and flexibility; and eight felt that they impede the efficient use of funds. As noted earlier, in their study of education funding in California, Thomas B. Timar and Marguerite Roza found that districts in the state offset the restricted categorical funds earmarked for high-need students by directing a larger share of unrestricted funds to lower- need students. To test whether California is a unique case, we asked on the state survey whether students with lower needs receive a larger share of unrestricted state funding to offset the categorical funding earmarked for high-need students. Six of our study states reported a similar practice: Alabama, Wisconsin, South Carolina, Mississippi, Massachusetts, and Utah. (see Figure 7) The accuracy of this response is uncertain, as state respondents may not know how districts at the local level use general fund money. Indeed, Colorado responded that it is likely to vary district by district. Although our state survey respondents generally supported the idea that categorical funding helps schools and districts meet state improvement targets and the requirements of NCLB, these were the perspectives of state finance officers. As noted earlier, we supplemented our survey with interviews with district-level respondents in four states—Arkansas, California, Ohio, and Wisconsin—to better understand the impact of categorical funding on school and district efforts to improve student performance and meet the requirements of state and federal accountability policies. Interviews with district leaders in four case study states were also generally supportive of categorical programs, but they provided some contrast with the state views. There was a sense that local actors are best suited to make decisions about how to spend money to meet the needs of their specific students. “I think the bulk of that is best left at the local level and I don’t have a problem with being held accountable,” said one district respondent. “The main thing is an issue of trust—can we be trusted to look at the characteristic of our students and spend the money wisely? I like to think that those of us in the business aren’t going to go out and buy a swimming pool,” said another respondent. There appears to be reluctance on the part of district leaders to do away with categorical funding for fear that the money would not be reallocated to the general fund, but also a sense that states should afford districts greater flexibility in exchange for greater accountability. District-level interviewees expressed a fear that if funding was all provided in the form of unrestricted base grants, the money would not be spent in ways to help those who need it most: low-income students, English learners, and special education students. They felt that maintaining categorical programs for high-need students would alleviate this concern. Districts also noted that overly strict restrictions on categorical programs prevented them from using the money in ways they deemed appropriate at times. Some categorical funding, for example, can only be used for programs, not for people, which may not be in line with the need. “It can be hard to use the money in the ways it was intended and still provide the services you want. For example, money that is designated for a program but can’t be used for a person limits our ability to provide needed services to students,” said one interviewee. Districts would prefer the flexibility to spend categorical funding on people, programs, or materials and supplies to meet their students’ needs in ways they deem most effective. Categorical funding has its detractors and its supporters, at both the state and district levels. While state-level survey respondents generally felt that categorical funding helps meet student improvement targets without limiting districts’ flexibility or ability to innovate, district interviewees noted the benefit of categorical funding in setting aside funds for the neediest populations who might otherwise be overlooked. Both groups, however, noted challenges to such funding programs, with interviewees citing a number of concerns including overly restrictive requirements on how the funds can be spent and limiting local actors’ ability to cater programs to the unique needs of their student bodies. Amid the continued economic downturn, state policymakers are faced with making difficult choices about which programs to fund, and district personnel are increasingly asked to do more with less. Our hope is that limited education budgets are put to the very best use for the greatest number of students so that all students can perform to their potential. Joanna Smith is a lecturer in the Department of Educational Methodology, Policy, and Leadership at the University of Oregon’s College of Education. Fatima Capinpin, Hovanes Gasparian, and Nicholas Perry are research associates at the Rossier School of Education’s Center on Education Governance at the University of Southern California.